Finally got back to the sewing machine this weekend. 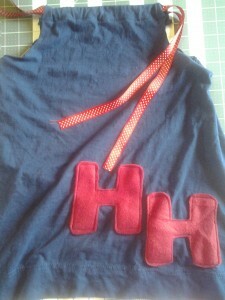 I made a pillowcase dress for Miss HH and patriotic curtain dresses for Miss HH and Miss C.
Wow, what a weekend! This is my first weekend doing media coverage for the Indy 500. I’m glad to have had the 400 at the Brickyard and the inaugural Indy Grand Prix under my belt before tackling this race. The new qualifying format had most people confused, including 3-time Indy 500 winner Helio Castroneves. He asked us after the press conference on Saturday what the new rules were for the Fast Nine Shootout. I don’t know that I really like the new format but it made Sunday interesting. It was a nail-biting final run as Ed Carpenter captured the pole position for the second year in a row. (he is the 11th driver to do so) I was watching his family as he completed each lap. It was fun to see them cheer him on and jump up and down as we all learned he’d secured it! Now that the field of 33 is set we have some great events to look forward to this week leading up to the 98th running of the Indianapolis 500. Particularly the Media Pit Stop Challenge at high noon on Wednesday, May 21st at Victory Circle. Having come in second place in our first 2 appearances, Naptown Buzz is hoping to take home the top prize of $5,000 for the Salvation Army of Indiana. Quick update – I am now a member of the glasses club. After seeing my husband go through torture with his treatments (read SHOTS IN HIS EYE) for histoplasmosis last year I decided I should get my vision checked. Turns out my vision is worse than his. Oh well – now we look sophisticated. Or old. I can’t really decide. October 19th has come and gone. Another year gone by. My little Gabe-man would be 4 years old now. I can’t believe it. I still miss him (and Felix) every day. I see the holes in our daily life and it hurts. I’ve been struggling over the last year with the fact that I haven’t “done” anything in their memory. I don’t have a foundation, I don’t make memory kits, I haven’t written a book, I haven’t held a memory walk. I try to remind myself that I have affected the lives of the people immediately around me. And that is good. We went as a family to the cemetery and had our birthday cupcakes, as is now our tradition, and the kids even sang Happy Birthday to him (which nearly destroyed me – sweet and sad entwined). It was a pretty “typical” birthday. This year was also different. This year I did something for me. Something “selfish.” And that was good, too. Ever since Gabe’s death I have not felt like singing. At all. It’s one of the things I love most and the grief just stole it away from me. I couldn’t think about singing in front of people – I knew I wouldn’t be able to without breaking down into tears. I just didn’t feel like it. How could I do something that brought me so much joy when I had suffered so much pain? Last year my sisters were asked if they would like to put on a Cabaret at the German club we’re a part of. They were so excited and they asked me to be in it. I was SO excited! Then I found out what day it was going to be. Saturday, October 19th. Really? I wasn’t thrilled to hear that. But, I thought, you’ll be fine. As time went on, however, I began to question myself. Could I really do it? Could I do it that day? We started rehearsals in September. I practiced alone in the car and I practiced at home. I began to feel a little more confident. I told myself that I was going to be fine. I really began to feel like I had been cheated out of some happiness and got “mad” about it. I decided I was going to take back my happiness that night. And I did. I not only sang in the show… I emceed. I had a fabulous time and felt great about it. It was still hard not to cry (Who wouldn’t? One of the solos I did was “Over the Rainbow!”) but I made it. I got so many compliments and so much encouragement and it was great. In fact, I’ve now rejoined the women’s choir and I’m hopeful that we’ll be asked to do another Cabaret someday. I know that my baby boys would be proud of me for not letting the grief get the best of me anymore. I really feel like this was a big step for me. I can feel that something broke free that night. I’m going to hang on to that feeling moving forward and see where it takes me. What have you struggled with in your journey? Do you feel like your joy has been stolen? Are there things you once enjoyed that you wish you could enjoy again? Please add a comment and let’s talk about it! Part of the reason I started writing was to help express my grief and be a resource and comfort to others who are traveling this road. I also wanted to help inform others and break the silence and taboo that surrounds infant loss. Now there is a major project out there with the same goal. Sean Hanish has written and produced a movie that is hoping to break the silence on a global scale. 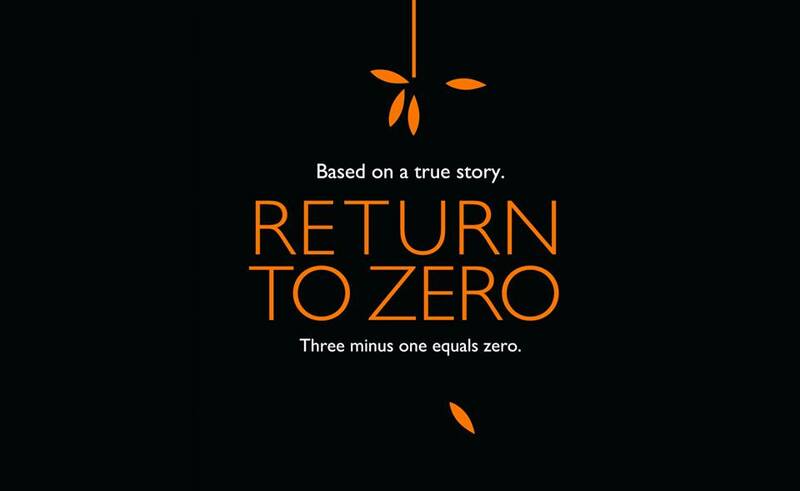 I am excited to be a local leader supporting his movie “Return to Zero.” It is based on a true story of a couple’s journey through stillbirth. It speaks of how life changes and how we each deal with grief in different ways. It shows their experience of having another child after loss. We as local leaders are helping by having people pledge to see the movie in its opening weekend. It needs this to get someone in Hollywood to pick it up so that people around the world can see it. My goal is to get 100 pledges by the middle of June. You can click here to sign the pledge. Make sure to enter my name in the local leader box so they know who sent you. Thank you for considering to support this movie. It will make a huge impact and help open up the conversation about grief and infant loss. All in all I think the yard sale went well. I made over $100. That was really over the span of about 3 hours so I’d say it was worth it. It was a nice day and I got to sit and chat with my hubby. I decided to set things out on tables and put one price for everything on that table (ex: $1 ea) and that worked really well. Saved me from putting stickers on 300 rompers. I only had a couple of people try to pressure me to drop my price on some things. I held my own and got full price from other people later in the day so that worked out. Now the plan is to take the biggest kiddos shopping for clothes since they don’t get any hand-me-downs. I hope to find some good deals on summer stuff. Now that it’s May they should be on clearance, right? Ha. I am already thinking about what I’ll have to put out at the fall sale. Can’t wait to clear out some more stuff! I want to tell you about our latest kid-venture. 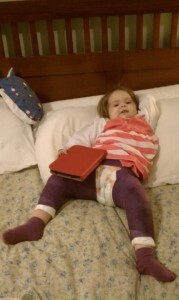 Our youngest daughter, Hannah, was diagnosed with bilateral developmental dysplasia of the hip back in October. Once we got the diagnosis and met with her doctor, Dr. George Gantsoudes at Riley Hospital for Children at IU Health, we decided the best thing for her was to do surgery to correct it. She is on the small side (as are all of my babies) so Dr. G wanted to wait until she was a little bigger to do the surgery. If we hadn’t done anything she would most likely have required double hip replacement in her 20s. We didn’t want blamed for that one! In March she had her surgery done. It was a loooong day! She was in for about 8 hours (surgery and MRI time). She had an open reduction including pelvic osteotomy and femoral shortening. She did magnificently! We were in the hospital for 4 days total – even though we were told to begin with it would 1-2 nights. Apparently when they do an epidural for pain control the anesthesiologists call the shots. They wanted it left in for 3 days. (poop) No one likes to be in the hospital but if we’d been prepared for that long of a stay we would have had a better attitude about it. At any rate she had excellent care during her admission. She was placed in a spica cast to keep everything in place. Coming home was a little scary. Just trying to figure out how to change her diaper and how to position her to eat, sleep and for entertainment. We got it figured out in a few days – not so hard as we thought. A lot of the relief came from her spica chair. 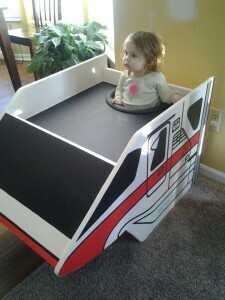 My awesome brother, sister-in-law and friend made her the most awesome Walt Disney World Monorail spica chair! She was in her first spica cast for 6 weeks. 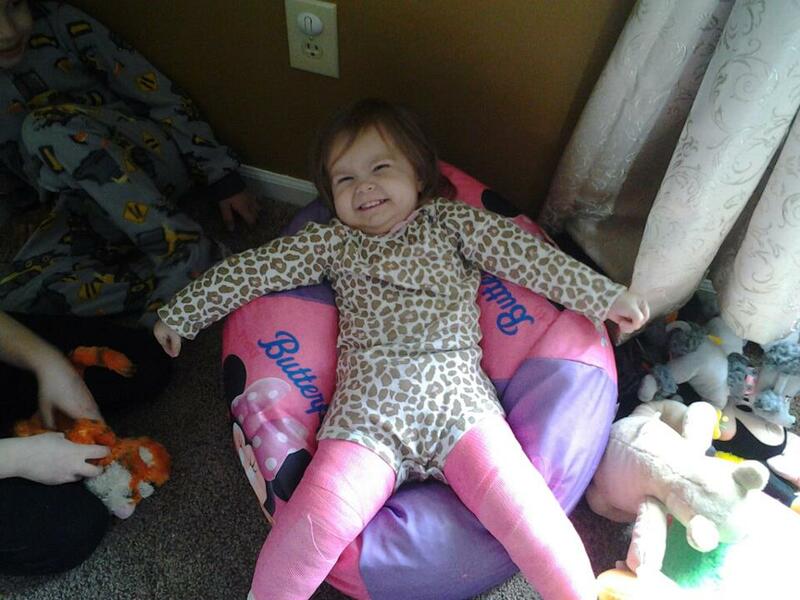 She just had the second cast placed last Wednesday and she is still doing so well! She has even pulled herself up to standing, like she’s not supposed to. She has so much of her parents in her. Rebel. In 5 weeks she’ll be out of this cast, have the plate in her femur removed about a year after that and then she’ll just be on follow-ups… until she’s 18! That is fine, I’m just glad that we found out when we did and she’s all fixed up now.